This past weekend I was surprised by my girlfriend with a getaway to the mountains in Idyllwild, where we stayed at the Quiet Creek Inn. It was a quick, one night getaway, and though I would have loved to be there for a week, even taking a day or two away from home is a great way to relax. 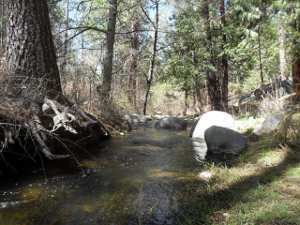 For those that don’t know, Idyllwild is a quiet little mountain community located in the San Jacinto Mountains, about 100 miles northeast of San Diego, and 100 miles southwest of Los Angeles. It sits at an elevation of 5300 feet, and is a great place for hiking and camping. From town, you have access to trails that take you up to Tahquitz Peak which is somewhere around 9000′ and San Jacinto Peak which is higher at 10,800′. 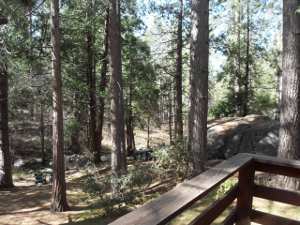 I’ve been to Idyllwild many times in the past for hiking and camping, so it was great to finally stay there in comfort at a nice cabin. 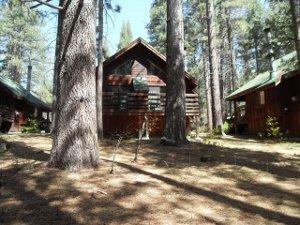 The Quiet Creek Inn is located right on a bubbling creek and has a selection of beautiful cabins. It is also pet friendly which was a perk for us since it meant we didn’t need to find someone to watch the dogs while we were away. The Inn is great in all regards; great amenities, great owners, and great location. There is even a “lounge” to hang out in where you can find DVDs to watch in your room, grab a soda or water from the fridge (pay using the honor system), or just hang out on the couches and relax. 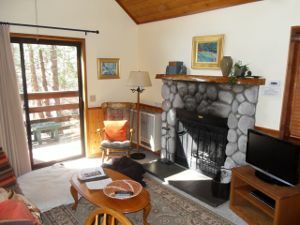 From what I could tell, every room has a balcony which overlooks the creek, and in the room was a fireplace, a TV and DVD player, living room and couch, kitchenette, bathroom, and bedroom. 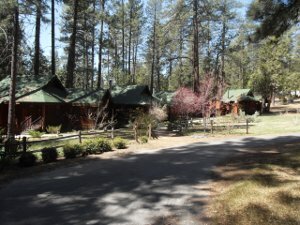 So if you’re ever in Idyllwild and want a nice romantic place (or simply want something more comfortable than a campground) to spend the night, I’d definitely recommend the Quiet Creek Inn. Since the trip was a surprise, I can’t say how much it costs, but I’m pretty certain that the prices are quite reasonable for what you get. There are plenty of restaurants in town, as well as plenty to do, but we opted to stay in and cook, watch a movie, and enjoy the room. It was a great weekend, the only thing better would have been to stay longer. Originally posted on Thursday, April 8th, 2010 at 5:56 AM	. Hi Russ, website looks awesome. It has a much cleaner look. Love you! My wife and I are looking into moving to Idyllwild and this sounds so peaceful. Great post! !